Poet Mary Jo Bang's comments about her covers show her to be, as always, interested in the visual world as a series of masks, performances, costumes, and veils. Which reminds us to remember the cover as covering, as staged prop, as inexorable and necessary deception: "The mysterious relationship between the cover and the poems," she writes, "serves as a veil through which I read the poems." "A cover that disappoints can make me dubious about the poems I’m about to read. Is it wrong to admit this?...I most admire book covers that tangentially nod to the interior text, yet don’t feel over-determined by it. ...I like that relationship to have a satisfying ambiguity, and to refuse a simple reductive deconstruction. It’s enough for me—just right for me—that the poems and the cover share a tone, or an artistic sensibility. It’s enough if they gesture toward something. I suppose I like finding my way to what that 'something' is." "Interior with Sudden Joy takes its title from the Dorothea Tanning painting on its cover. The actual painting is large [and has been split] between the front and back covers...isolating the two charmingly transgressive women on the front cover. By flipping the book over, the two assume their proper place in the original tableau of a strange (interior) room. Like the poems within, the image is both psychologically rich, and slyly playful. Both share a fusty Freudian sexuality; both hint at a narrative but refuse completion. Both speak of desire." 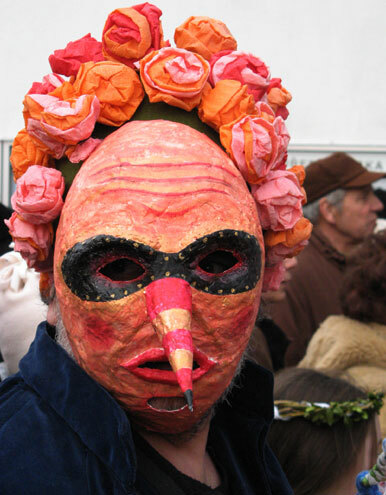 "The cover's photograph, by Kristen Wright, is called 'Masopust' — which is a Czech pre-Lenten carnival period (like Mardi Gras) in which costumed villagers perform skits or dances in front of homes where they are paid for favors with treats so 'that there will be no hard feelings during the days of merriment.' The young merrymakers with their dragon kite on the cover are set against (and headed into) an eerily empty landscape; similarly, in Bibbins’ poems, a celebratory insouciance is complicated by a sense of a difficult world... The speaker stands just off stage, or behind a mask, saying just what we could say if we dared (and had a mask to hide behind). The poet’s sky-blue name, with its playfully balloon-ish font, links him with the sky into which the imaginary dragon flies and the child and young adults are marching beneath. The name sits atop a gray wall, a layer of world, as it were, and below that, on a second layer of gray, is the child-like, pre-cursive printed title in crayon yellow. The font reminds one of (and links Bibbins’ poems to) the opening credits of Dr. Strangelove, and of the later concert film, Stop Making Sense. All of which gestures towards a lineage." "The cover is designed by Chip Kidd, a graphic novelist who is equally or even more well known for his book covers and designs; it takes a photograph of a statue of Mary by Michelangelo and blurs her face into a vague shape with enough suggestion of eye, nose and mouth, to read 'female' and 'face,' but she remains an otherwise empty vessel. In retrospect, her closed eyes communicate her Madonna piety, as does the slight downward tilt of her head. On the cover, she only has, because she only needs, half of a face; that half-face is further divided by a playful zipper line of tiny black type aligned, not horizontally as convention dictates, but vertically down her face, like a seam that might be opened to reveal an inside, if only she had one. The small letters, visually arresting against the cream-colored background, grow closer and closer together, as if some kind of gravity were tugging at them." Mary Jo's covers are the only ones of our series to date that center exclusively on the human figure. In a different, less protean, less abstract sense than Nick Flynn's, they are marked by a preference for the unsettling and the unsettled. She has chosen a painting of two women in a state of dangerous half-undress (as indicated by the burning cigarette almost, but not quite underfoot); a blurred Madonna with half a face, a line of text streaming down the face that seems to me not so playful as MJB suggests, but rather, tearful; and a small family, with no visible faces at all, under a dragon kite, turned away from us, towards a vast and empty plain. Thank you, Mary Jo, for these powerful images; thank you to all of the other poets who generously contributed their thoughts-- Don Share, Nick Flynn, Jesse Ball, Stephen Burt, David Lehman, Major Jackson. And thanks to you, for commenting and reading this past week! It's been wonderful.